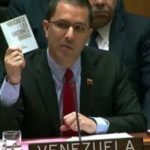 26 Jan 2019 – This morning Venezuelan Foreign Minister Jorge Arreaza presented a brilliant defense of President Maduro’s government, against the attempted coup d’etat engineered by the United States and its proxies in Europe and newly right-wing Latin American countries Peru, Brazil, Argentina, Colombia and Ecuador. The United States called this “emergency” meeting, seeking the authorization of the United Nations Security Council for intervention in Venezuela’s internal affairs, and the infamous regime change similar to that which spread chaos in Libya and Iraq after the UN authorized military intervention to overthrow the governments of Saddam Hussein and Omar Khadaffy. 28 Aug 2018 – Criminal UN Security Council Authorized Military Actions and Sanctions are Gross Violation of Sustainable Development Goals and Obliterate all Hope For Attainment of SDGs.